cheerymishmash: The great BIG getting to 446 likers on facebook giveaway!!! The great BIG getting to 446 likers on facebook giveaway!!! 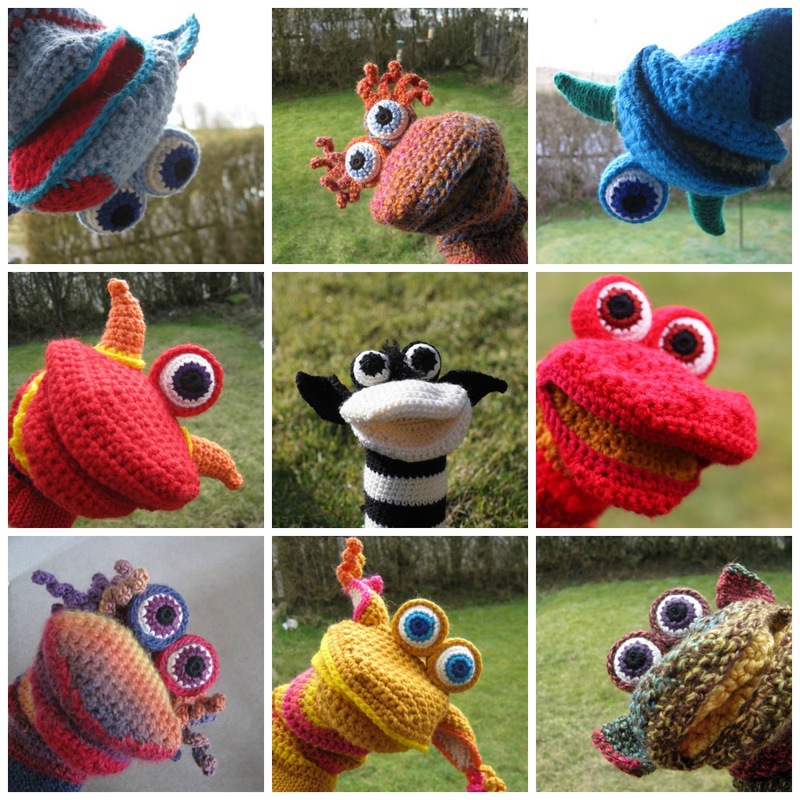 So, if you want to be in with a chance of winning a puppet of your own customerising, keep reading... and if you don't, then you should probably go and find something else to do now cos you'll probably find the rest of this post quite boring! And then secondly, because I'm a little bit running out of ideas for names and descriptions now and I'm a little bit lazy, you need to tell me what your puppet would be called and what their most favouritest thing EVER would be. Oh and one other thing, which should really go without saying but there's always one (at least), Anonymous comments will not be entered into random selctiony thingy because if I don't know who you are then it's kind of hard to find you to tell you've won! Hi. 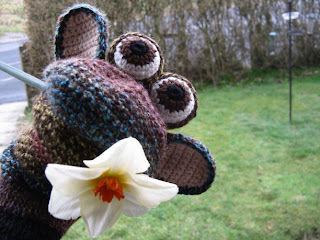 I love Madalene Mudpie puppet....because she looks a bit ditsy just like me! My puppet would be callesd 'Ooops...plop', as that was her response to being asked her name just as she dropped her bestest rock down a well by accident which resulted in a satisfying 'plop' as it hit the water. Sorry about the deleted reply above, the comments box froze on me?!? I love all your puppets, they are wonderfully zany and so colourful! If I had to choose a puppet of my own it would be Knitty Natty, made of all sorts of colour combinations and flowing rainbow locks, she would love all things yarn, so much so you can't see where she ends and the yarn she loves so much starts, a sort of a yarn tactic explosion of fun! Ps. Grey tshirt with red star. It's ace. My favourite item is difficult to say. 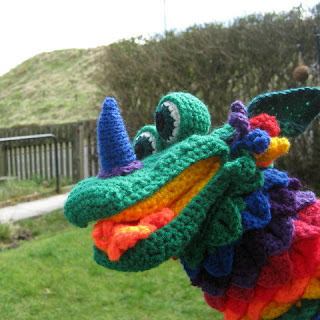 I love the Pangolin purse - the rainbow colours are fab. But, I am also partial to the fun crochet bag! My favourite puppet is Madalene Mudpie with her cheery face. My puppet would be called Toby TJ in honour of my two great nephews who are two very mischievous children! Favourite things: Eating licorice and dancing to music - any kind of music! My most favourite item that you do ( apart from the big puppets of course ) is the snail finger puppet. I love the colours and it's little antennas ( is that what they are called ? ). My puppet would be called Limbo Madagascar. He has a tuft on his chin. His most favouritist things ever ever are Disco dancing in his jelly sandles and waving at people on trains ( his favouritist film is the Railway Children ). 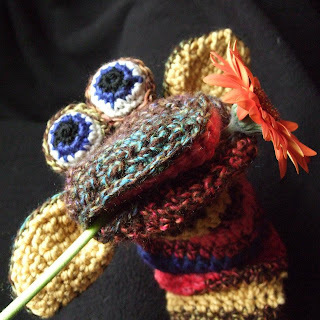 my puppet would be called choco baba ,his fave thing would be chocolate buttons, and blowing bubbles in the garden ,also loves dancing to rock music !! Oh my favourite items has defo got to be a custom puppet you did, it had to be sunshine coloured . My puppet would be called Red and she'd look alot like one of my favourite fraggles off fraggle Rock and she'd have the crazy hair bunches that look like cheer leaders pom poms,i think she'd be a little bit of a joker so her favourite thing would be to place random items into peoples shopping trolleys when they're not looking and to jump out of the clothes rails and say Boo at unsuspecting shoppers.She also likes long funky stripey multi coloured socks toe socks. I can't decide between Louis bombouis puppet and your lovely owls, all the things you sell are fantastic! If I had a puppet it would be all rainbow colours, she would be called Lollylovely because she loves eating lollipops. She also loves flowers playing in the garden and has a thing about pretty buttons.